I love flowers, who doesn’t right? I have a bit of a unique flower background as my parents owned a flower business when I was little and so I had the opportunity to watch them for hours on end, handling and arranging flowers for all types of events including weddings. I wired flowers, cut flowers, arranged flowers and loved spending time helping and watching my Mom and Dad create beautiful arrangements. So I feel a unique fondness for styling pretty blooms. Today I’m thrilled to announce that I’ve partnered with FiftyFlowers this year to bring you some major Flower Power! 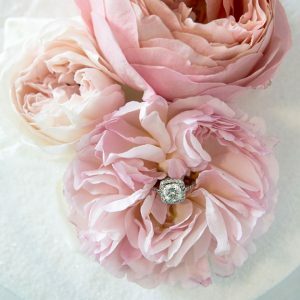 Each month I will be featuring a specific, popular wedding flower, sharing important tips and information that all DIY brides will find valuable if incorporating said blooms into their events. Whether you’re arranging your own bridal shower flowers or creating your own wedding bouquets, you’ll want to keep an eye out for these new posts. First up, the terrific tulip! For those who might not know, FiftyFlowers is an online flower wholesaler who ships gorgeous flowers to your doorstep, straight from the farm. 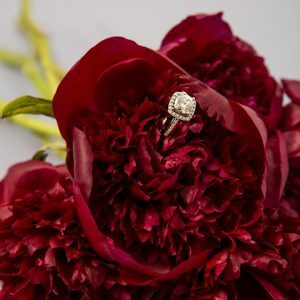 Their customer service is outstanding and I know that you’ll have an extraordinary experience with them, no matter if you’re ordering flowers for your entire wedding or just a few bunches for your bridal shower. You can shop their website just like you would a flower mart, even scheduling your delivery time with just a few clicks – it’s awesome. I absolutely love that at any time, no matter what shoot or event I need flowers for, I can visit their site, shop and the flowers magically arrive at my door. Basically, they are the Nordstrom of online flower sales! In this post, I’m featuring the standard Russian White and Blush Bulk Tulips, the Mysterious Plum Parrot Tulip, the Pink Bliss Double Tulip and the Whispy Pink Parrot Tulip. Aren’t they all just so stunning!? 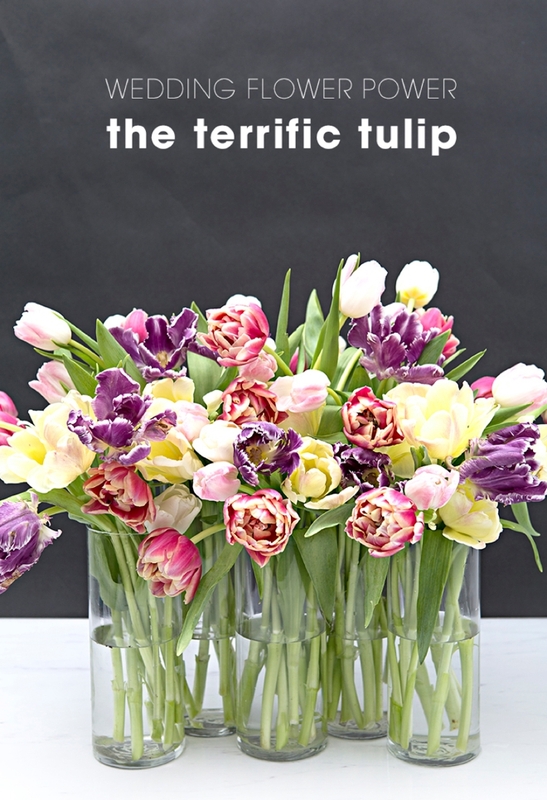 Your Tulips will arrive in a large box, looking a little sleepy and thirsty which is totally normal. In comparison to other flowers, they are easy to take care of and it doesn’t take much to make them look fantastic. Fill vases/containers with at least 4 inches of fresh, cool water. The Tulips will drink an exceptionally large amount of water upon arrival. 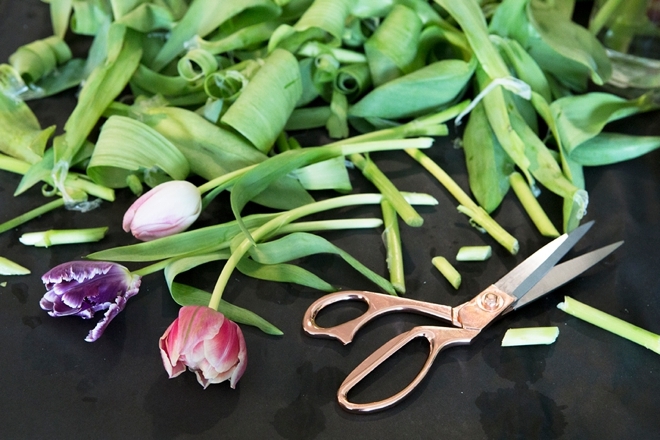 Immediately after cutting, place the stems in the prepared water. 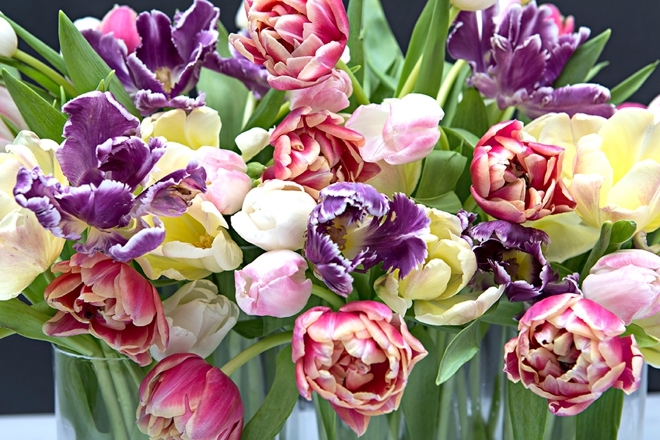 Your Tulips will actually continue to grow for about a day after they have been put in water! 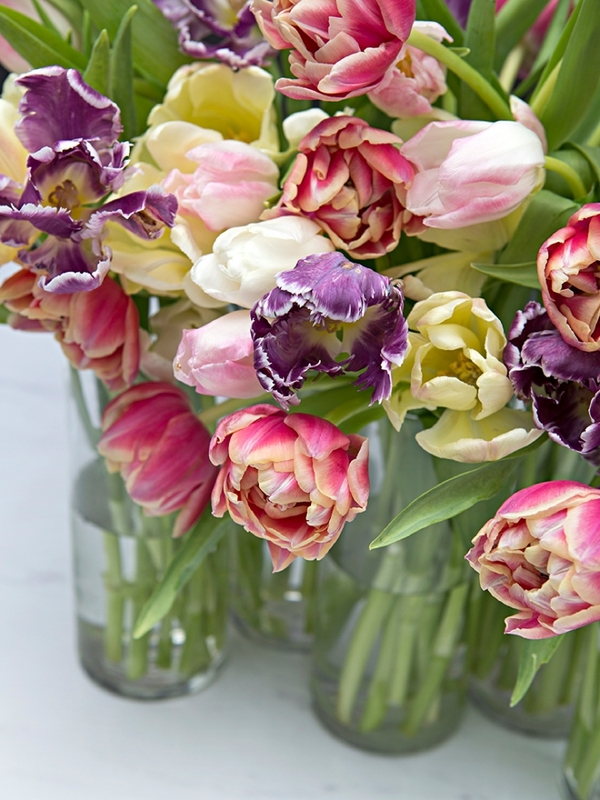 Allow Tulips at least 4 hours to hydrate, but it’s best to wait at least 8 hours before arranging them. Keep Tulips away from direct sunlight, drafts or excessive heat. 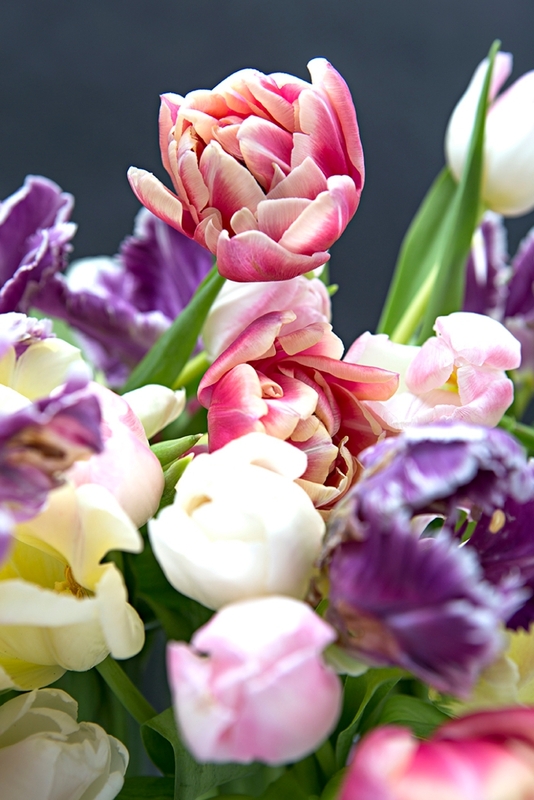 Place Tulips in an area with even light, or rotate them regularly as Tulips will turn to face the light. Change water every 24 hours to keep them fresh. This will keep the water from becoming contaminated with bacteria that blocks the flower’s ability to absorb water! Tulips are fairly strong and have a hardy, thick stem. Each stem only has one bloom on it. The stem length varies by variety, from 10-22 inches, so keep that in mind when planning your designs. To see their beautiful, bright green stems, gently pull off the outer leaves. 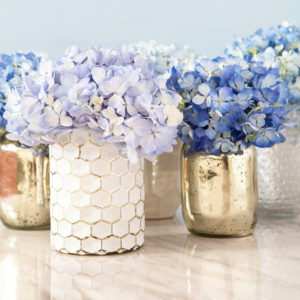 Remove all the leaves for a super clean look, which would be perfect for bud vases. Color block! 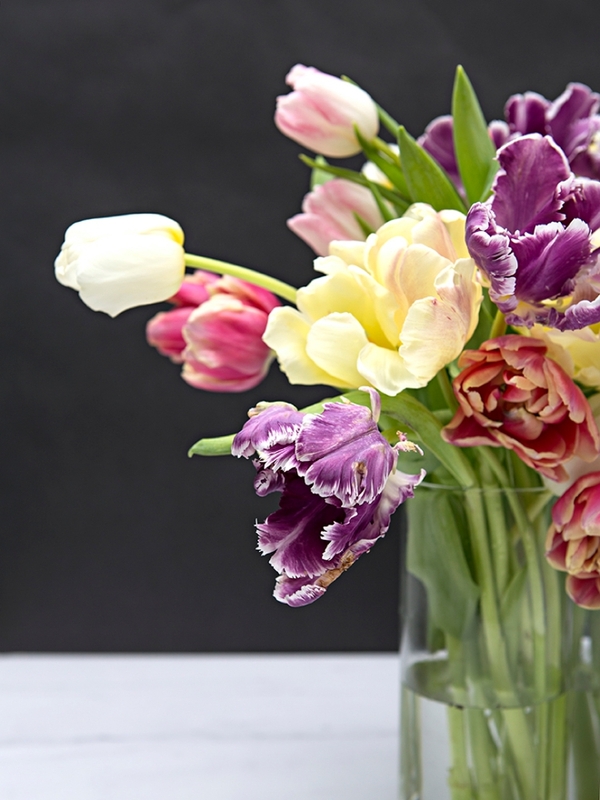 Arrange your tulips in sections of color like I did in the black vase. 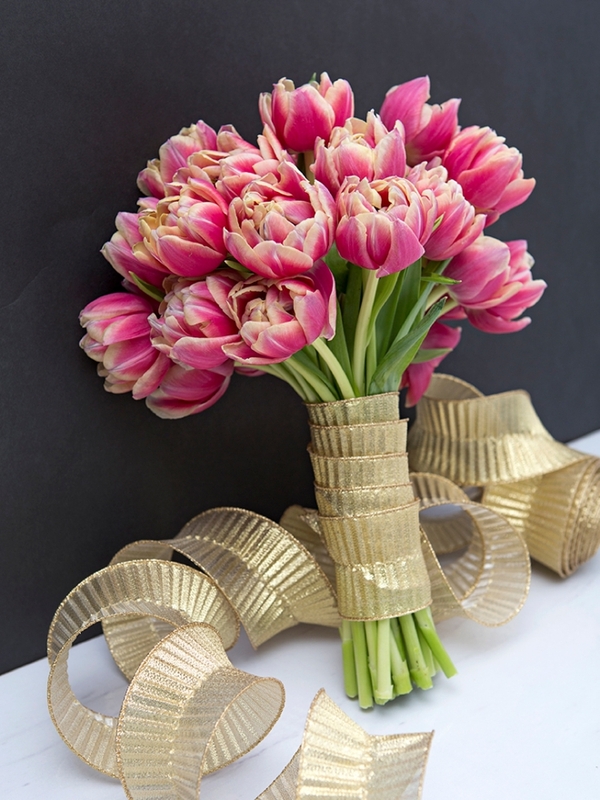 Tulips hold up fairly well out of water so they are an excellent choice for boutonnieres. 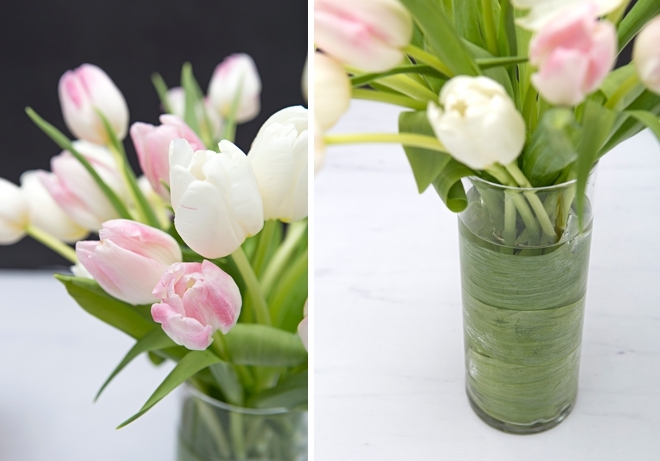 Wrap extra leaves around the stems before you submerge them in water for a polished look in a clear glass vase. 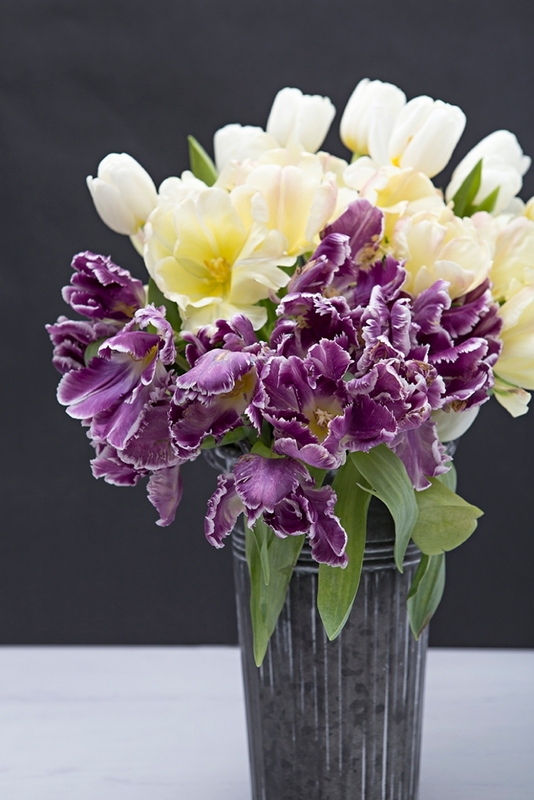 Opt for a bouquet made entirely of one type of Tulip! 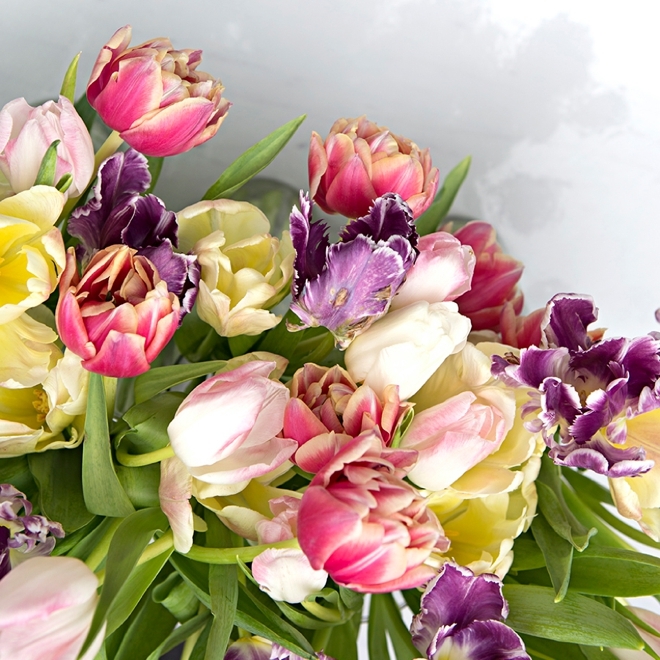 Tulips look spectacular when used alone, and they have the most beautiful natural built in greenery, their leaves! Since their leaves are such a bright green, using other greenery in a complementary shade like Belles of Ireland or Ornamental Kale will look best. 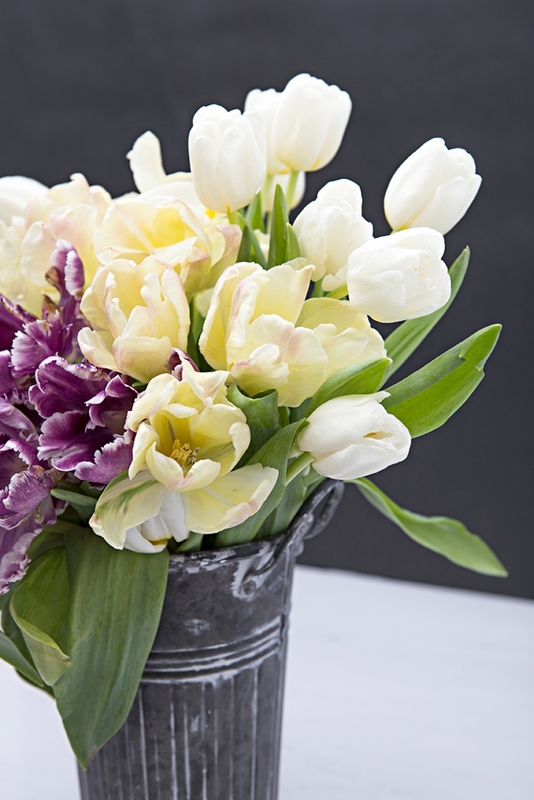 Tulips truly are a classic flower that honestly pairs well with almost anything, but I would recommend pairing with other romantic blooms such as Garden Roses, Peonies, Ranunculus and other spring bulbs such as Daffodils, Iris, and Hyacinth. 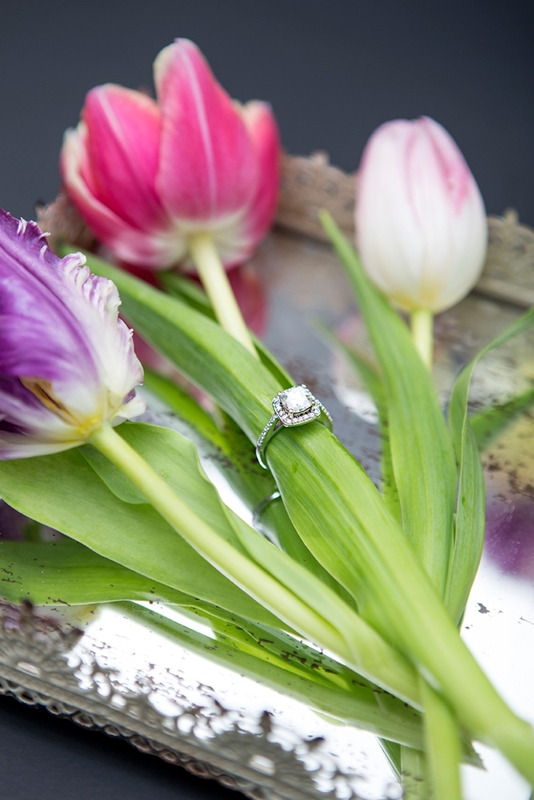 Tulips are considered the heralds of spring and they represent health, fertility and eternal life. Tulips are phototropic, meaning that the blooms will follow the light, actually bending towards it. They are one of the only flowers that will continue to grow once cut, see a time-lapse of it here. Back in the day, Tulip bulbs were used as currency!